We can probably all agree that getting along with your employees and/or your coworkers is a good thing. Happy workers tend to be more productive, and more productive workers means more money for everyone. Having a staff that gets along is imperative for any business, but that’s only the beginning. A company should be welcoming and friendly, while remaining professional and productive. We all like to have a bit of separation between our personal life and our work life. However, that doesn’t mean that they cant bleed a little bit into each other. It has been proven that employees who were more engaged with their coworkers were happier than their less engaged counterparts (Davis 2017). As an employer, it is important to provide positive feedback to your employees. Remember to socialize with them, so they see you as a leader, rather than someone they are in opposition against. Being able to feel comfortable around fellow coworkers is important to the well-being of any employee. There is a limit to these interactions, however. As coworkers become friends, they begin to find common interests and share with one another more and more. This office “gossip” and “chit-chat” can be unproductive, and productivity is vital to any business. As an employer, setting specific times, such as lunch hour, can give your employees the time they need to socialize. Note that by forcing employees to completely cut off non-essential communication, their engagement with others is lowered and they can become unhappy and unsatisfied with their jobs. Everyone needs a break sometimes. 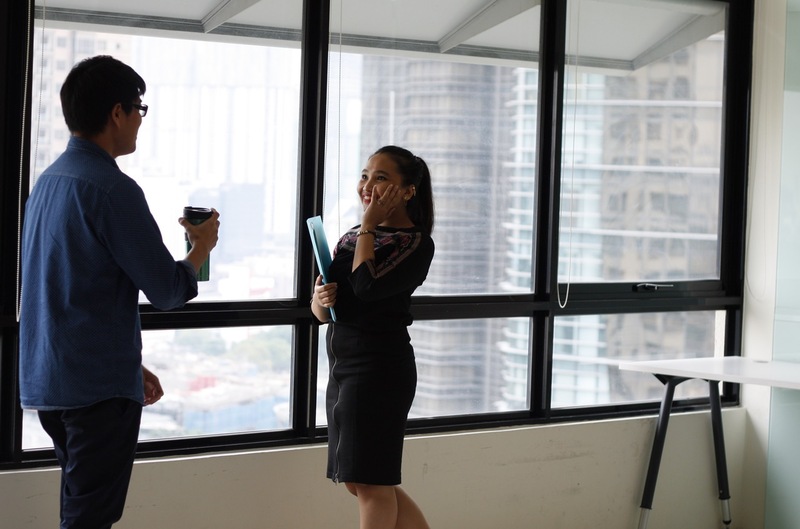 As an employee, you can work to keep conversations with colleagues, during working hours, brief, possibly using them as a sort of reward for a completion of a task. A social employee is a happy employee, and a happy employee is a productive employee. Remember to allow your employees to socialize and join in on the conversations. Talk to your coworkers and get to know them, you may have more in common than you think. Davis, Sadie “Increasing Happiness in the Workplace,” The Kabod 3. 3 (2017) Article 3. Liberty University Digital Commons. Web. [19 May 2017].